God’s Great Creation (henceforth, God’s Creation) is an “I Can Read! Level 2” book from ZonderKidz. An excerpt from the Adventure Bible, these short books encourage children to read Bible stories specifically written to their reading level. The pictures, provided by David Miles, are a colorful (and often fun) depiction of the story. The wording of God’s Creation is a noticeable step up from “I Can Read! Level 1.” There are conjunctions, phrases, sets of nouns and many other constructs raising the level of difficulty. Level 2 books are supposed to contain “engaging stories,” and the story of God’s Creation does not disappoint. To start, the six days of creation are described. This is followed up with a depiction of the fall of man and God kicking them out of the Garden of Eden. Mild issues may be taken with the story (e.g. the creation of the animals on day six is skipped) but the general inclusion of the fall of man alongside creation was refreshing. 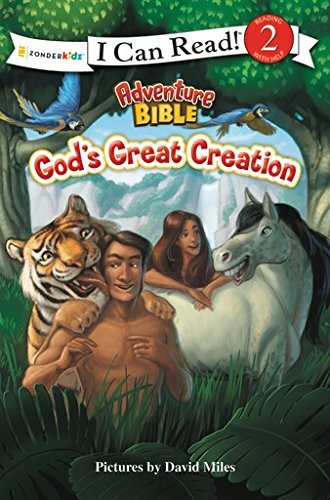 Our daughter, who is familiar with the creation account, loved the story. Aware of the Heidelberg Catechism’s answers concerning “Adam and Eve in paradise” she instantly recognized the depiction of “our first parents” and their fall and disobedience. Admittedly, she calls it her “coronation book” (thanks Frozen) but God’s Great Creation has been an excellent addendum to our family worship and Biblical education.